Unit5Do you have a soccer ball? Unit7How much are these socks? 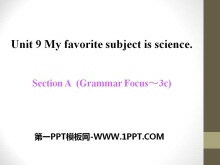 本课件属于人教新目标版七年级上册英语unit9《My favorite subject is science》的教学素材MP3音频课件，课件贴合课文内容，可与本课PPT课件匹配，敬请下载！ 关键词：《My favorite subject is science》教学课件，人教新目标..
《My favorite subject is science》PPT课件17 一、单项选择。 1.I have music class______4：00 P．M.. A．in B．on C．at D．for 2．After class，I play sports______an hour. A．on B．at C．for D．in 3．______do you li..
《My favorite subject is science》PPT课件16 1．整点时间的表述 整点时间可表示为钟点数＋o'clock或直接读钟点数，省去o'clock。 2．【辨析】Mr.，Miss.与Mrs. Mr.(先生)，Miss.(小姐)和Mrs.(夫人)均用于姓氏前。Mr.用来称呼.. 《My favorite subject is science》PPT课件15 1．如何使用星期名词： (1)表星期的词：Sunday(星期天)；Monday(星期一)；Tuesday(星期二)；Wednesday(星期三)；Thursday(星期四)；Friday(星期五)；Saturday(星期六)。 (2)书写..
《My favorite subject is science》PPT课件14 单元语法精讲 特殊疑问句 特殊疑问句是对谁、什么、怎么样、什么时间和什么地点等的提问。句末用问号，回答必须明确，不能用yes，no来回答。 ①针对事物的名词提出疑问，疑问词用..
《My favorite subject is science》PPT课件13 1．Why do you like science? 你为什么喜欢科学？ Because it's interesting.因为它有趣。 why是疑问副词，意为为什么，用来询问原因，答语通常为连词because(因为)引导的句子。e..
《My favorite subject is science》PPT课件12 1．What's your favorite subject？你最喜欢的学科是什么？ My favorite subject is science.我最喜欢的学科是科学。 (1)该问句是英语中常用句型，用来询问对方最喜欢的事物。其..
《My favorite subject is science》PPT课件11 一、用what，because，why，when，who完成下列句子。 1．______is your mother's favorite color? Red. 2．_____is the boy's brother? Li Dong. 3．______is your father's birt..
《My favorite subject is science》PPT课件10 基础知识梳理 重点单词 根据汉语或英语提示翻译下列单词 1. 科目 __________ 2. 科学 _________ 3. 体育 ________ 4. 因为 __________ 5. 一节课 _________ 6. 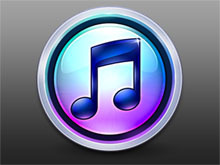 空闲的 ________ 7..
《My favorite subject is science》PPT课件9 本单元主要讲述学生在学校生活中的喜好及其理由。这个话题贴近我们的实际生活，很实用、很有价值。我们大部分时间都生活在学校里，你对学校生活是怎么看待的呢？如对老师、对所学..
本课件属于人教新目标版七年级上册英语unit8《When is your birthday?》的教学素材MP3音频课件，课件贴合课文内容，可与本课PPT课件匹配，敬请下载！ 关键词：《When is your birthday?》教学课件，人教新目标版七年级上册英语..
《When is your birthday?》PPT课件17 一、单项选择。 1.My birthday is ______ January and Peter's birthday is ______ March 26th. A．in，at B．in，/ C．in，on D．on，in 2．When is Mr.Wang going to the US? On ______..